The camp inside the park is super close to the central stairs – great for us! On the days it wasn’t pouring, we made our way up and out into the main bouldering/hiking section. Many day visitors don’t go too far along this route, being content with reaching the picnic/play area at the top. Past the stairs, almost immediately after, is First Pillar. It’s nice, not particularly climbable in the upward direction but fun to scramble around on. 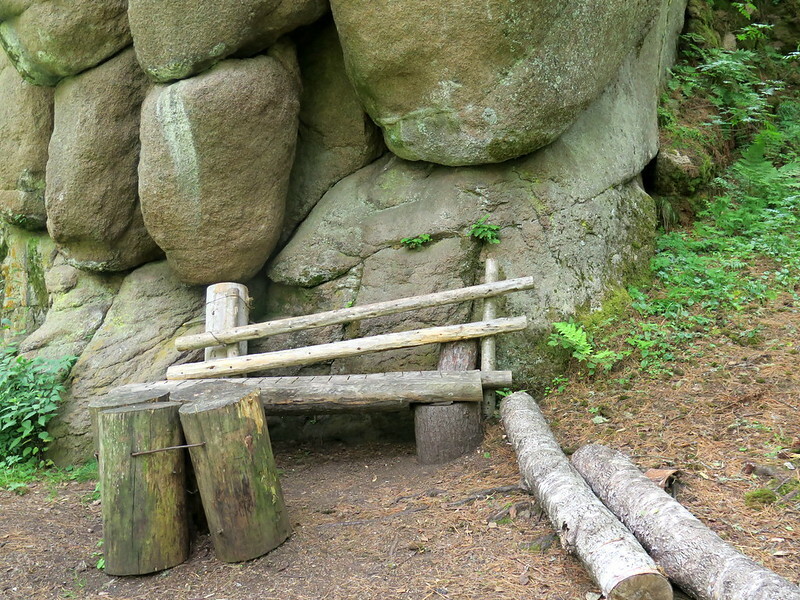 There are little training boulders scattered around, including some for kids. The path from there splits. On the first day we visited the yellow/blue trail. 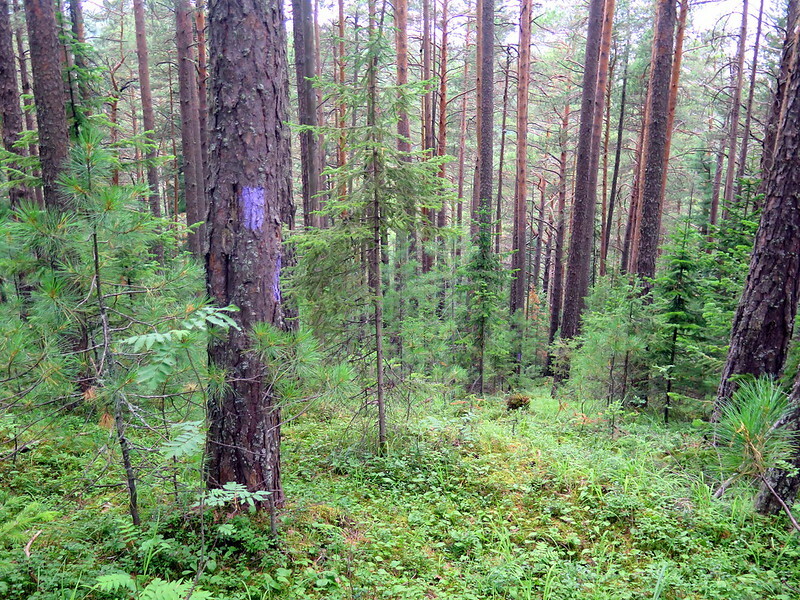 The markers are a vivid stripe of blue and another of yellow on trees and rocks around the park. 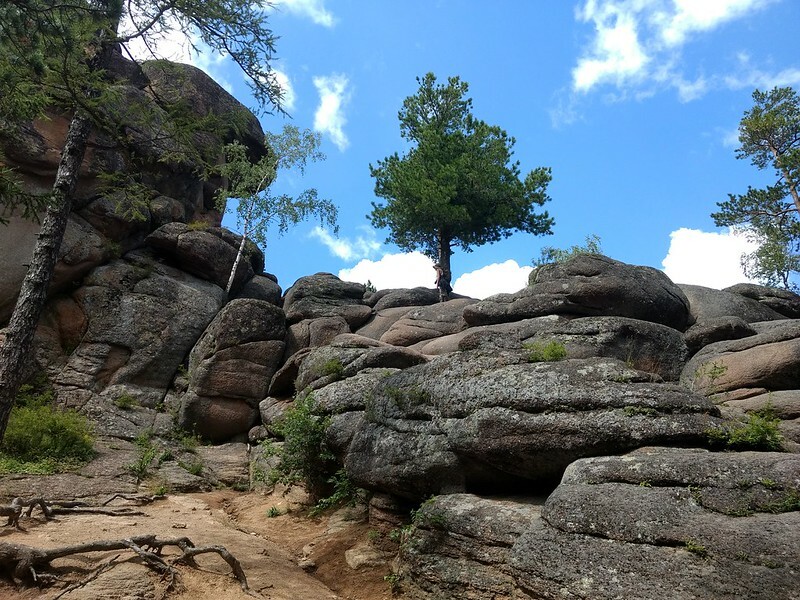 It’s a pretty short hike and really focuses on climbable boulders and pillars. Some of the rocks have names, some of them don’t. We found a fun one to climb on the way to Ded (grandpa) pillar. 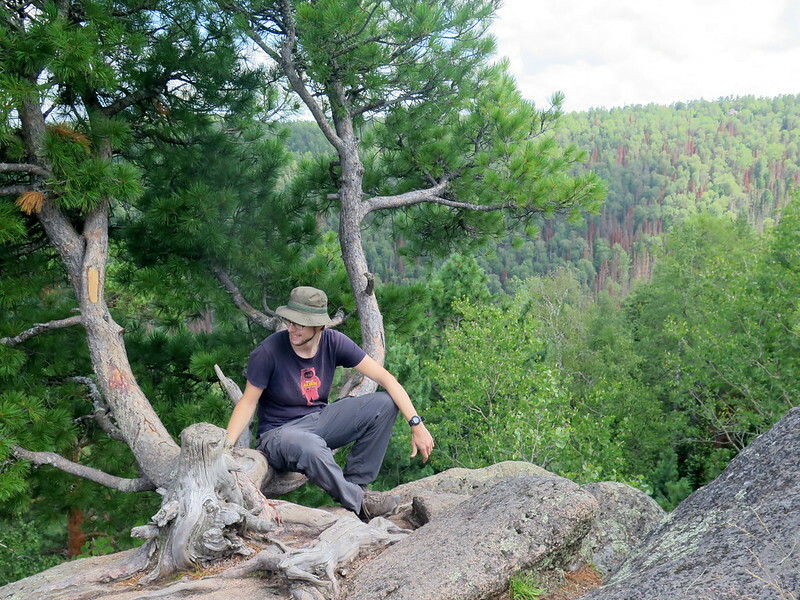 Here we got to scramble through a little stone chimney and wander around somewhat above the treeline. 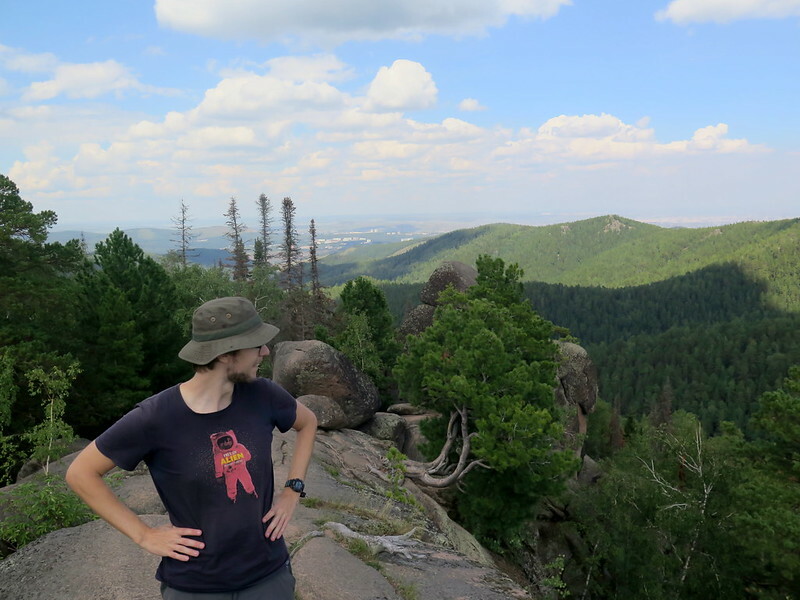 There was a nice little ascension point at the base which was a good warmup for the slightly harder second half of the climb, just out of sight of the picture. Ded pillar is a pretty popular one. We met a few families climbing around on it. There’s a low easy section that’s a lot of fun to run around on and has some hollow sections that fill up with rain to make ponds. From here you can see over the park and into the city. There was a whole family leaning over to take a selfie with Krasnoyarsk. Ded rock also has a much, much harder second portion. You can climb on the taller segments but the path is hard and not straightforward. We only know this because we saw an old man gripping his way around the rock. He was leathery and cut, probably climbing these rocks most days. 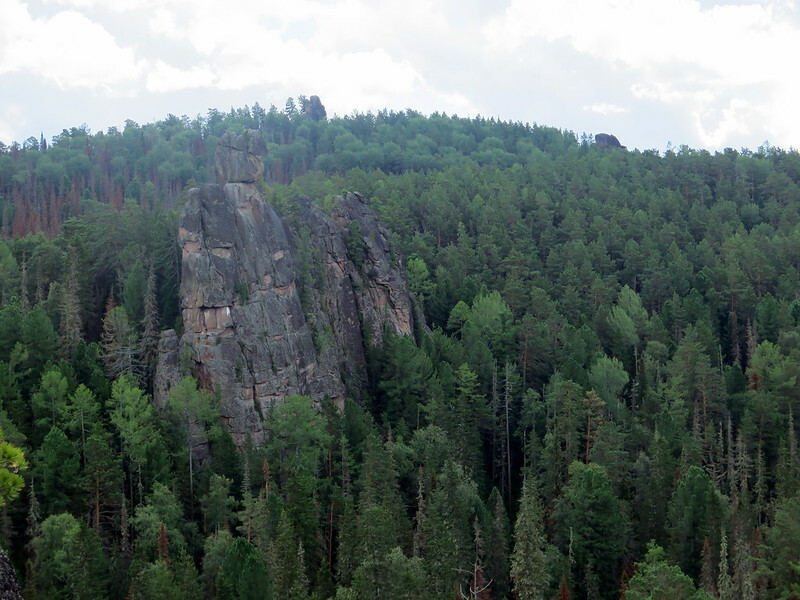 Around the loop we hiked, skipping Perya Rock, instead reaching in about half an hour Third Pillar (3rd rock!). 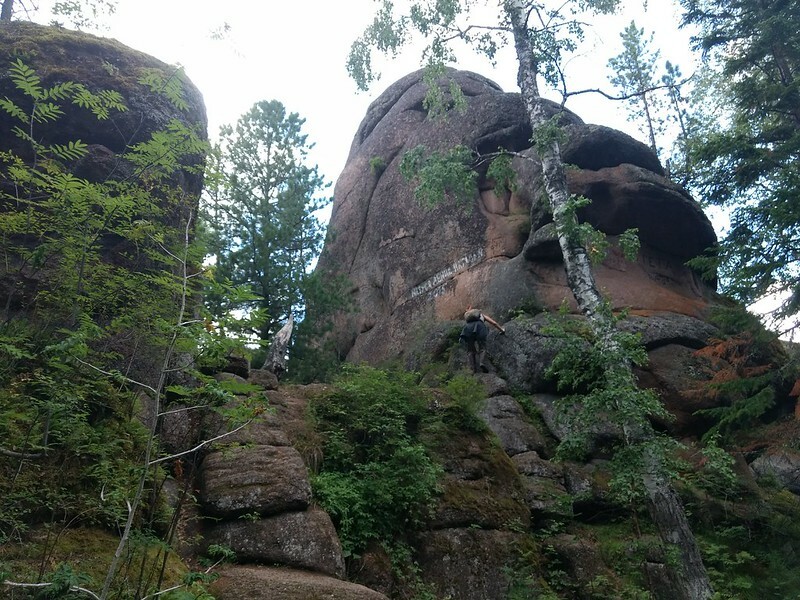 Lots of good climbing on this one! 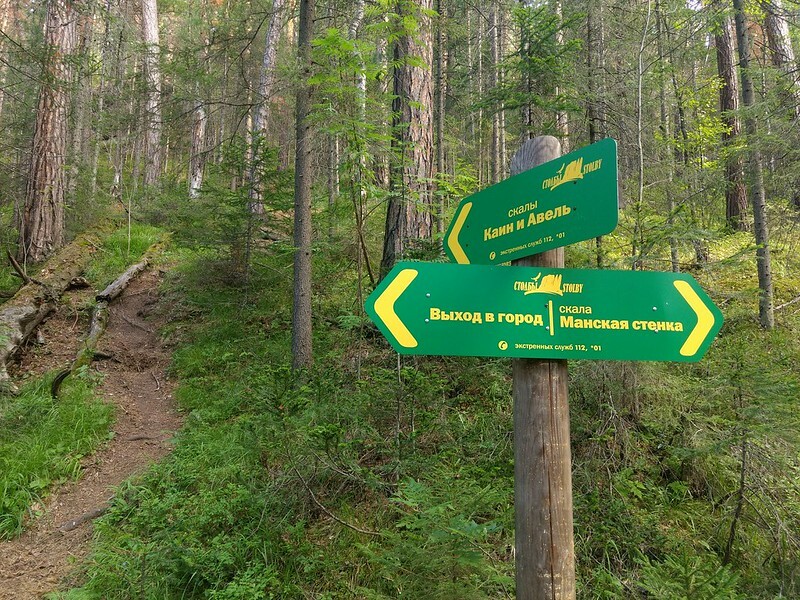 The paths in this part of the forest intersect rather freely, so we had to make sure we were on our trail several times. There’s at least one path that goes from this area all the way back to town. Right nearby is Fourth Pillar, and then the trail loops back around towards first and second pillars. Back to camp we went, let the rains pass for a day, and headed out again. This time we went on the purple trail. This trail goes way south into the explorable region of the park, does a tight loop, and returns. 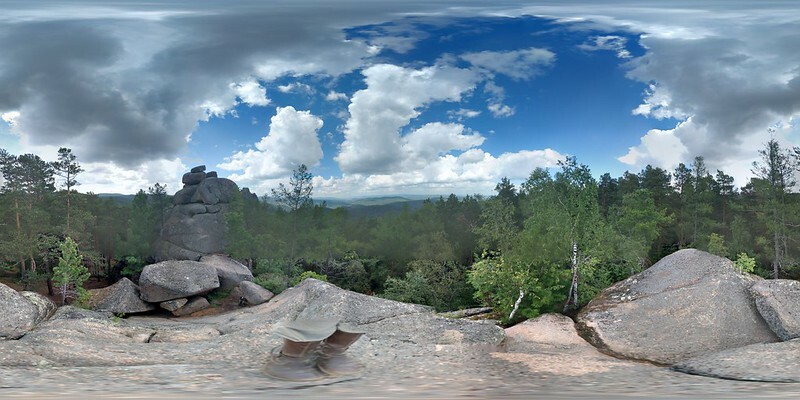 It’s a lot more hike-y and way less climb-y than the other trails, though there are still some good rocks to be found. 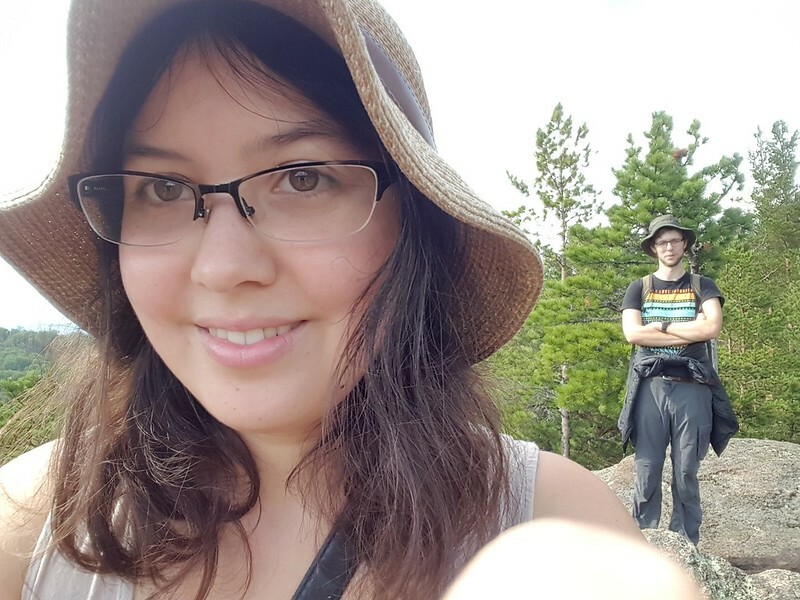 It has a lot more bog and mosquitoes, so that’s not as nice. But the wildlife is wilder – we saw a pack of wolves (wolf and german shepherd mixes mostly) running not 40 feet from us. We did not get a picture, but we also didn’t get eaten, so yay! 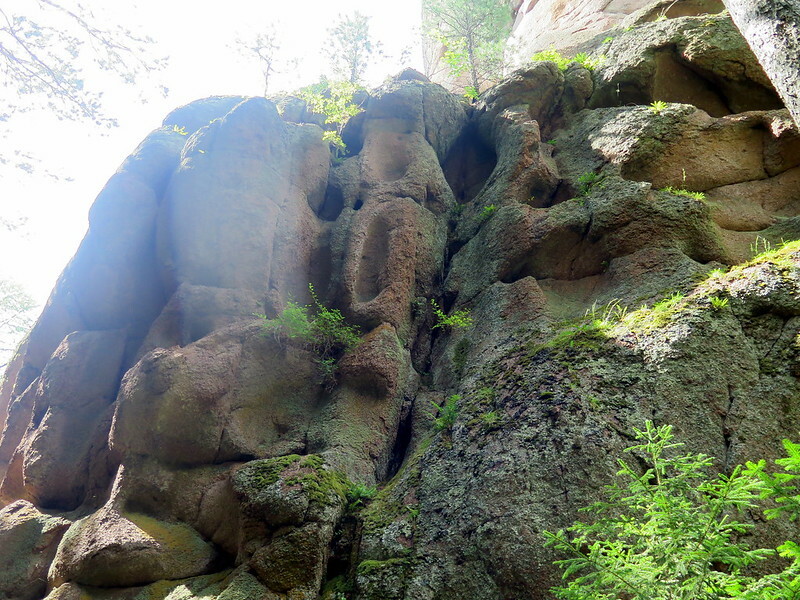 Along that route we saw a lot of weathered rocks – large pockmarks and crevices. And plenty of good rocks for climbing. Some more difficult than others. We actually got to the end of the purple trail, dire warning sign and all! 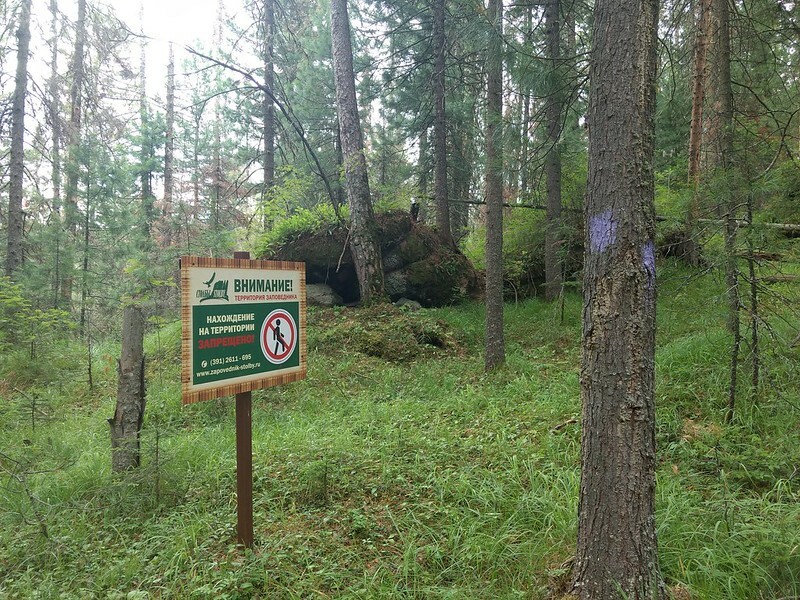 It makes sense in this park – the land here is supposed to remain free of human interaction, and the only way to guarantee that is to ban most humans from entering the true nature reserve. The chipmunks living past this line in the forest do not get fed nuts and berries from tourists. Out near the final rock someone had set up a little picnic area, a little disused. 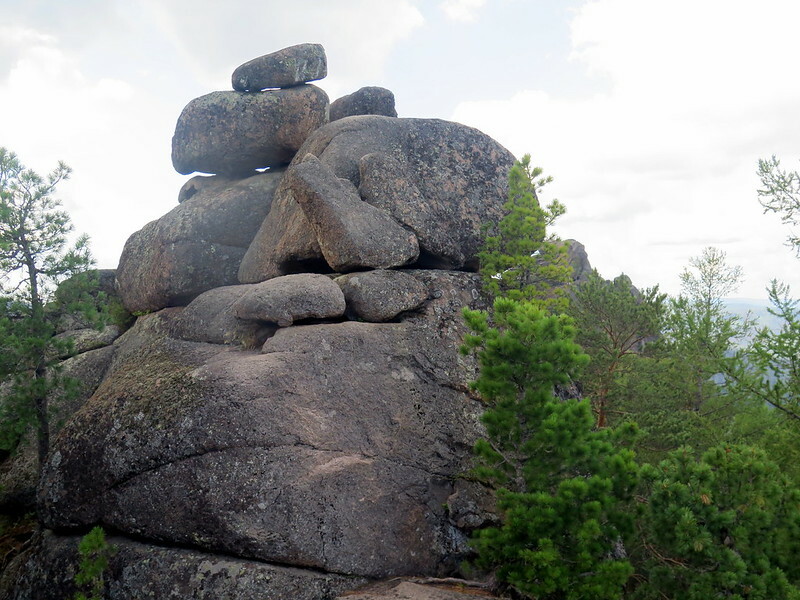 We saw some traces of previous visitors but really, if you want to be alone in nature, this is the spot. 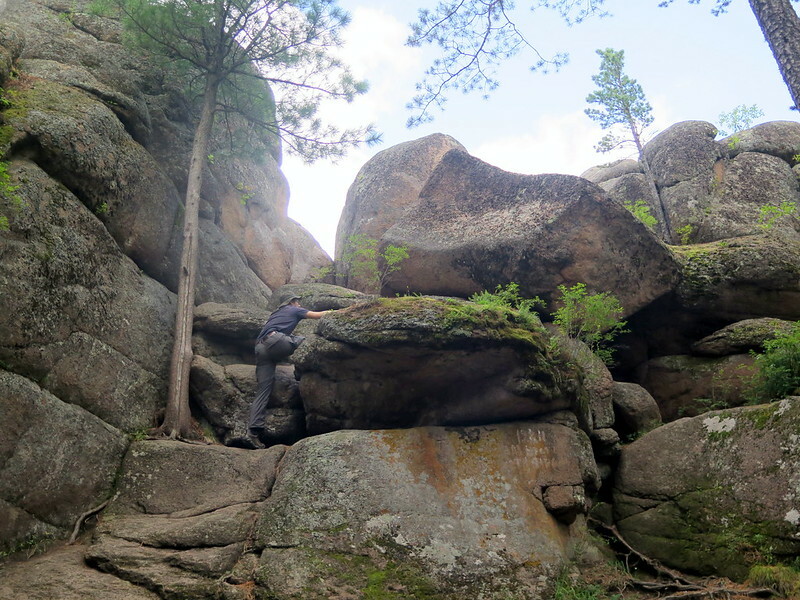 On our way back we had the pleasure of searching for the Cain and Abel rocks. This was a fun diversion for a while and really got the sweat flowing. 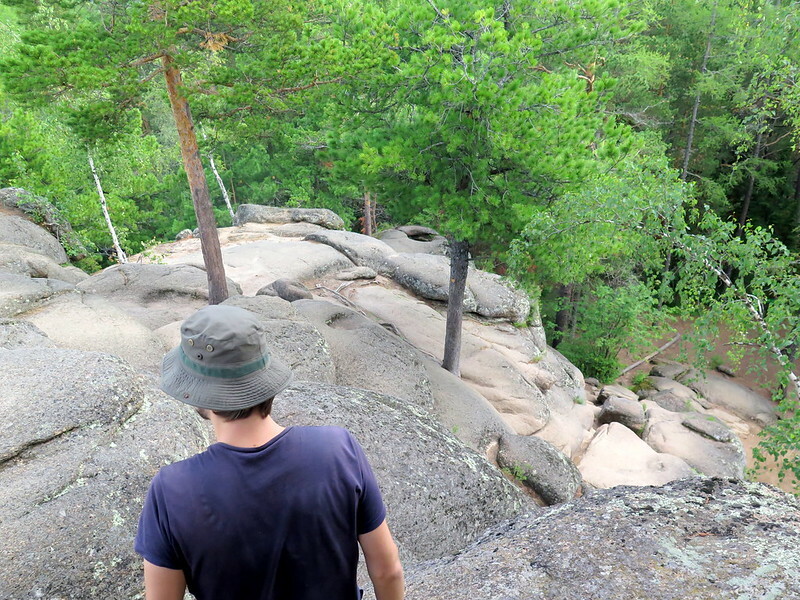 The trail we came in by is at ground level, while the ‘loop’ portion of it is ten or more meters above that, so we spent a lot of time climbing straight up a very steep slope looking for the loop portion of the trail. We got lost for a while, going much further east than we intended, and had to backtrack. 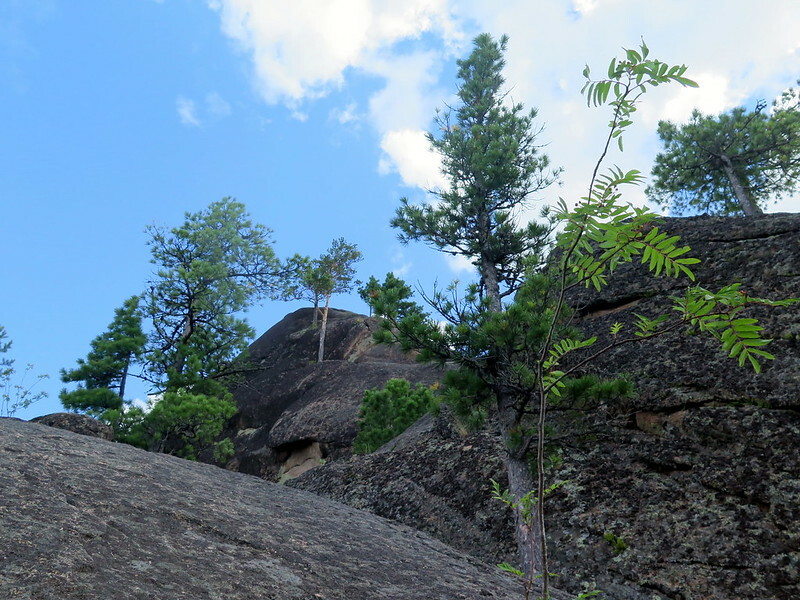 Finally our legwork paid off – we found the trail and the rocks we were looking for. The view from the top was grand. The day was clear and we could see the park stretching on and on. 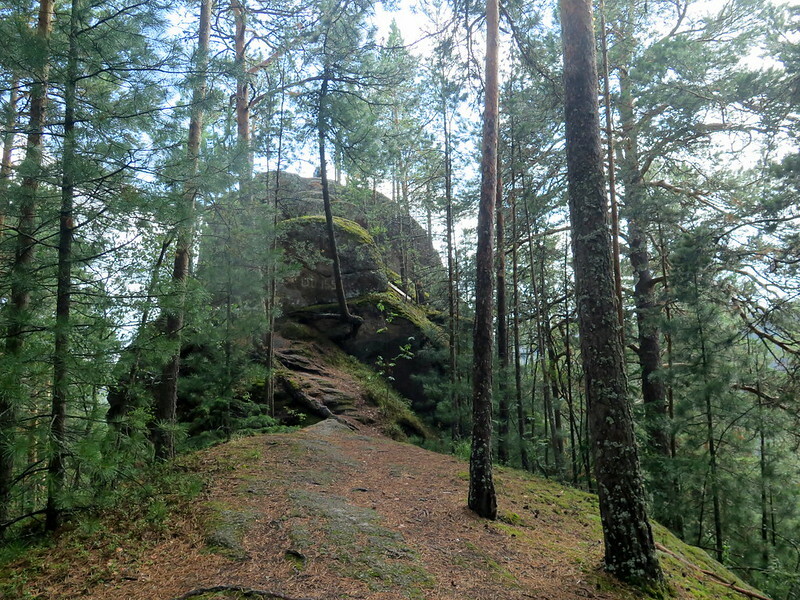 There were other large rocks within out sight and we could see where parts of the forest had been burned or hit by disease. A real bird’s eye view! 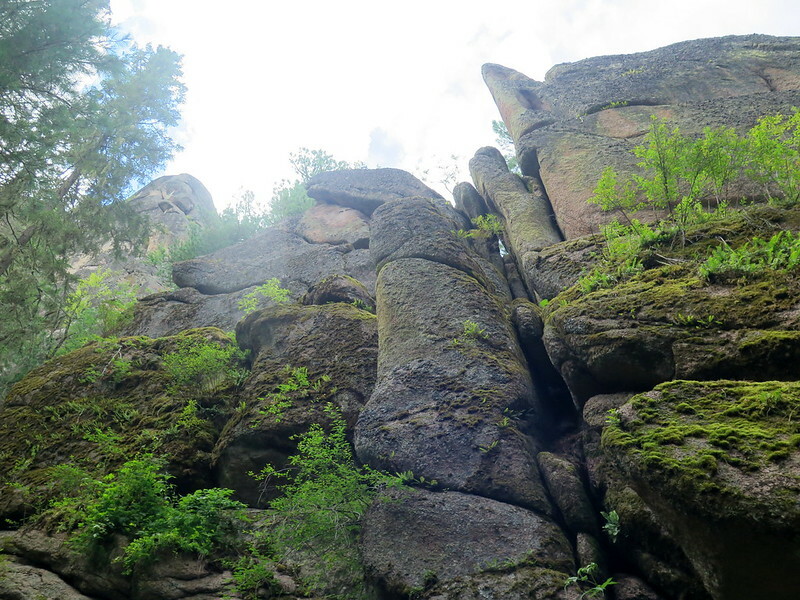 The rock we were on had some climbable rocks jutting out pretty far over the cliff proper. Here Natalie climbs those rocks while I sit grumpily afraid of heights for her in the background. The nature in the park is remarkable. Trees here grow huge from the tiniest cracks in the pillars. One day they’ll help force apart the rock and cause their eventual collapse. 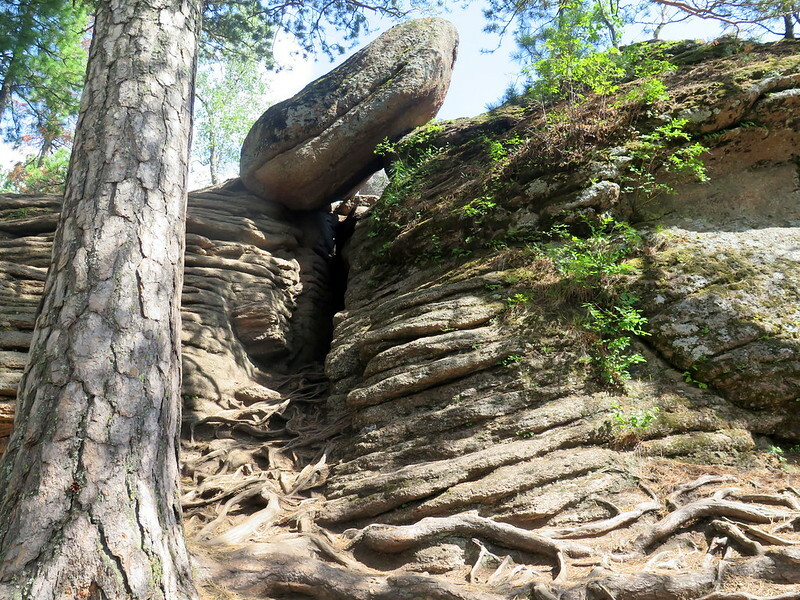 Here is one such fantastic tree, its roots crawling all over the rock searching for any purchase. We were not the first people to sit in it for a picture, we definitely won’t be the last. That tree is rooted in tight. Done with Cain and Abel, we headed home. 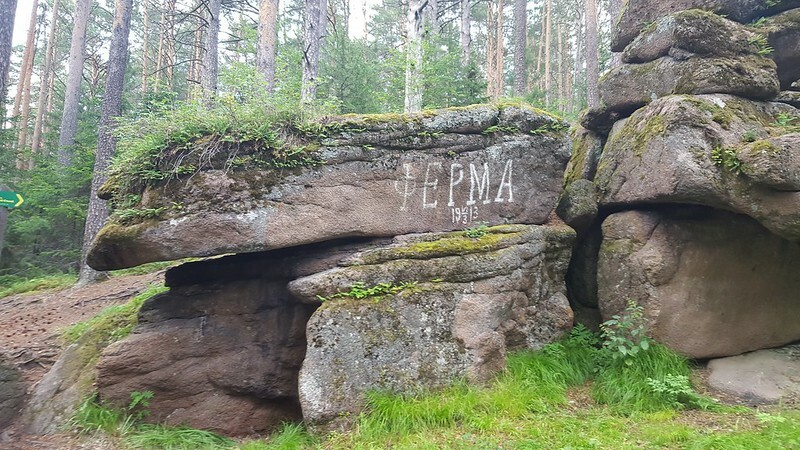 On the last stretch back we encountered Farm Rock (ferma). We’d been seeing signs for this rock the whole time we were here, and we finally found it! 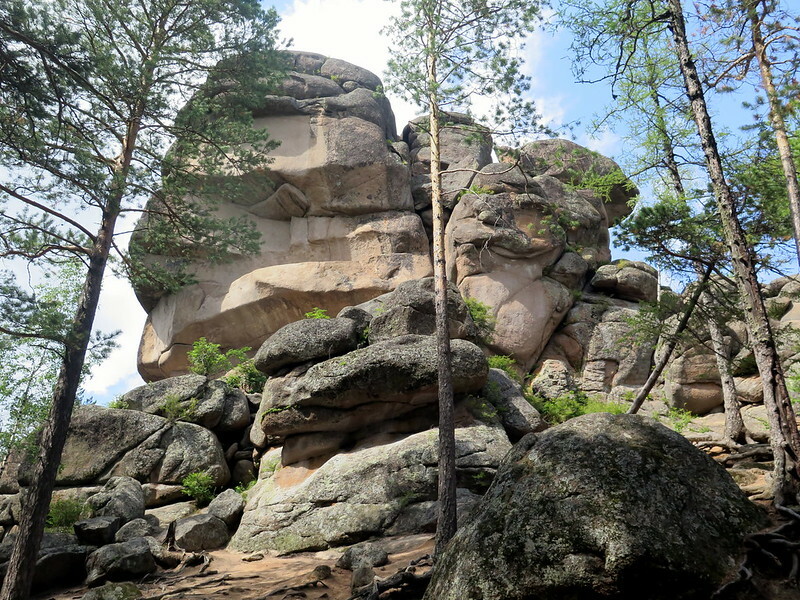 It’s a good short-hop bouldering site with lots of interesting low-height routes. Why it’s called a farm, I have no idea. 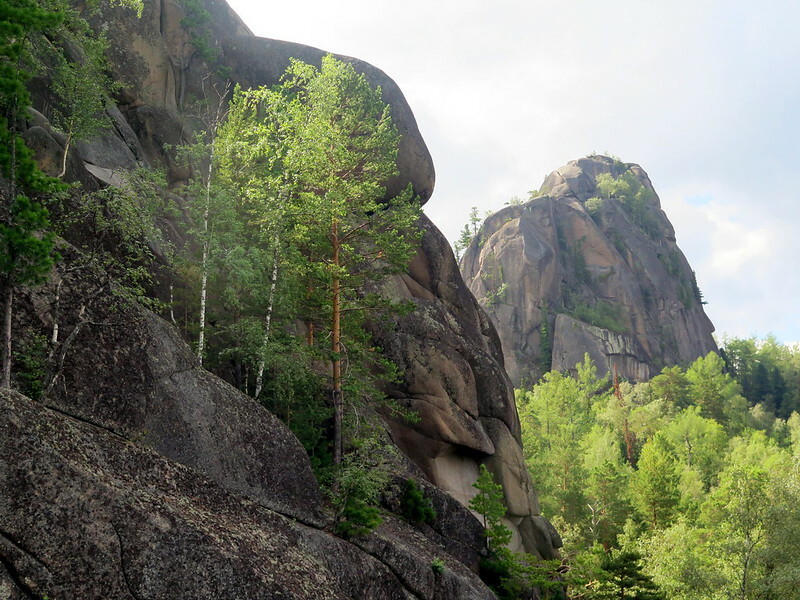 We had a great time hiking and climbing in Stolby. Since we were there taking pictures, we also made this map of the paths we explored!